Singapore's Chinatown is the original Singapore, cleaned up for the tourists. Gone are the street vendors and the petty crime of yesteryear, with gleaming renovated shophouses and malls standing in their stead. Chinatown was home to the Chinese migrants who drove Singapore's economy in the British colonial period. In the old days, Chinatown merchants sold cloth, gold, medicine, and traditional Chinese food. The shophouses are still occupied by entrepreneurs, albeit of a different sort: budget hotels and hostels, advertising agencies, jewelry stores, and T-shirt manufacturers sit alongside traditional crafts stores and Chinese medicine halls. Within these boundaries, you'll find the following interesting shopping stops. Chinatown's street market, centered around Trengganu and Smith Streets (location on Google Maps), is the first shopping sight travelers see, being located right across from the MRT station exits. 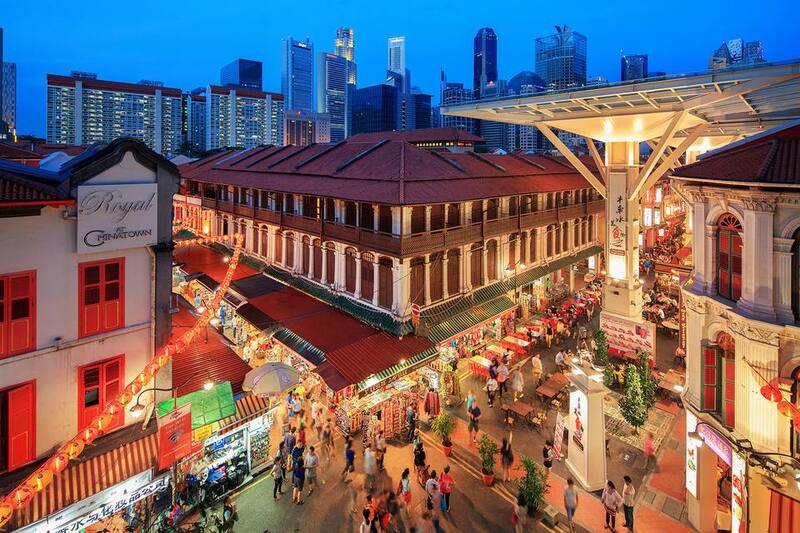 The narrow streets of Smith Street, Trengganu Street, Temple Street, Sago Lane and Pagoda Street offer Singapore's best street shopping experience, centered on what used to be the island's opium district. The Street Market was first introduced in 2004 as an attempt to recreate (and clean up) the old-school street hawkers of Chinatown, minus the street trash and the cheats. About 140 stalls line the streets, offering great deals on gray-market electronics, traditional crafts, fashion rip-offs, and antiques of questionable provenance. Great hawker food can be sampled on Smith Street, known alternatively as “Chinatown Food Street”. The hawkers along this al fresco space serve up Singapore's most famous foods, from laksa to roast duck to char kway teow to Hainanese chicken rice. Stalls start selling by 10am and close for the day at 10pm. Avoid visiting during high noon, and come instead at dusk as the street lights and stall illumination turn the Street Market into a magical sight. People's Park Complex (1 Park Road, official site, location on Google Maps) presents an interesting mix of stores selling traditional Chinese goods and cheap modern items - clocks, electronics, jewelry, and textiles jostle alongside religious icons, Chinese herbs, and traditional Chinese food. For many locals, People's Park is a repository for old Singapore nostalgia through stores selling old photos and Chinatown memorabilia. Travel agents and massage parlors also call People's Park Complex home. There are a fair number of cellphone and cellphone-related stores in the complex, though those stalls have a reputation for dishonest service, going by its dubious distinction of “most complained-about shopping center”. Singaporeans hankering for the good old days converge on China Square Central (18 Cross St., official site, location on Google Maps), whose most popular attractions draw on an appetite for nostalgia. On Sundays (9am to 6pm), the China Square Central Flea Market sets up shop in the main atrium, hawking kitsch and retro goodies in excess – comic books, retro appliances like rotary telephones and grandfather clocks; antiques; and toys – all taking up two floors of the mall. Chinatown Point (133 New Bridge Road, official site, location on Google Maps). You won't miss this towering structure on New Bridge Road, and the 220-plus shops within its five floors of retail space. Of particular interest is the four-level Podium B within the store, a series of shops known collectively as the Singapore Handicraft Centre selling a wide range of handicrafts, including (but not limited to) porcelain, bronze artifacts, wood carvings, paintings, antique furniture, Chinese musical instruments, and traditional embroidery. Other bargains within the building include watches, cosmetics, shoes, and cosmetics. Speaking of cosmetics, Chinatown Point also houses a number of good-value beauty salons. This is the last remaining hill in Chinatown; two other hills had been leveled, their mass used to reclaim the sea in the 1890s. Lately, Ann Siang Hill has found a second lease on life as a home for boutique shopping brands – Ann Siang Road and Club Street, in particular, are lined with cute entrepreneurial shops selling quirky but high-quality apparel and accessories. The decades-old shophouses along Ann Siang Hill now carry retail brands banking on the strong retro vibe of the neighborhood, from noted haberdashery Aston Blake to Aster by Kyra’s Peranakan-inspired ceramics. Stay till after dark, and flit between the bars that come to life at night. Yue Hwa (70 Eu Tong Sen St., official site, location on Google Maps) is a Chinese-themed department store housed in a hundred-year-old structure that used to be the Nan Tin Hotel, the first luxury hotel in Singapore to have an elevator. The award-winning renovation added screen walls, stained glass, and other architectural elements that enhanced the building's aesthetic value without demeaning its history. All six floors now cater to the traditional Chinese shopper - selling traditional Chinese medicine, silks, porcelain, furniture, and an incredible assortment of teas and tea-making accessories. The goods at Yue Hwa tend to be pricier than those you’ll find in market stalls – but the quality is definitely higher. Their seasonal items – particularly during Chinese New Year – are unique and highly desired by locals in the know.